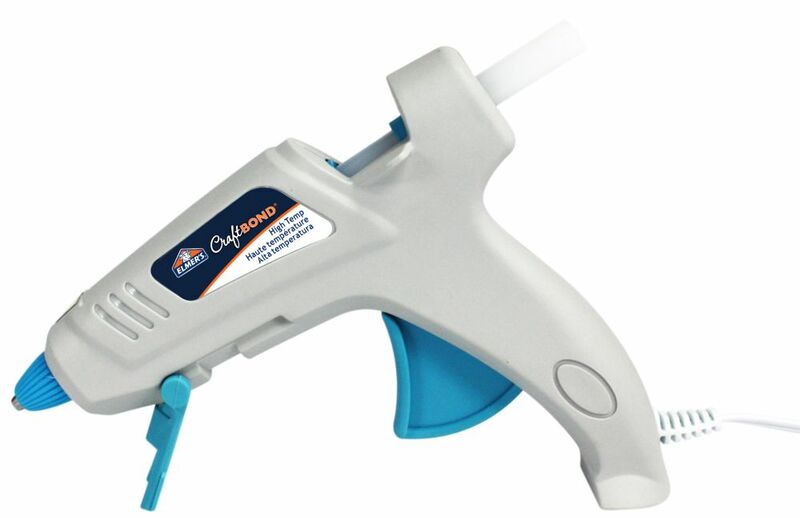 Elmers CraftBond High Temp Glue Gun (40 Watts) is a quality tool that provides you with a safer way of gluing! Added safety features include: insulated nozzle for safeguard against burns, safety fuse that shuts the gun off in an event of a short, and built-in side lifts allow for tool to rest safely on its side, preventing glue backup. High temperature glue gun is for bonding materials such as metals, plastics, wood, leather, paper and ceramic. The ergonomic design ensures comfort while gluing and the durable flip-down stand provides stability while not in use. Full Size High Temp. Glue Gune - 40W Elmers CraftBond High Temp Glue Gun (40 Watts) is a quality tool that provides you with a safer way of gluing! Added safety features include: insulated nozzle for safeguard against burns, safety fuse that shuts the gun off in an event of a short, and built-in side lifts allow for tool to rest safely on its side, preventing glue backup. High temperature glue gun is for bonding materials such as metals, plastics, wood, leather, paper and ceramic. The ergonomic design ensures comfort while gluing and the durable flip-down stand provides stability while not in use.